Selecting a budget, 5.1-channel amplifier, customers compare their features, sound and usability. Is Yamaha RX-V383BL vs Pioneer VSX-531 more powerful, fast and solid? Therefore, the speakers are easy to set up and the sound adjusts to the room. The Yamaha amp is easier to operate versus its Pioneer counterpart thanks to 4 scene buttons that provide the users with great comfort in accessing the necessary features, input source and the selected songs. These buttons can be reset by pressing them for 3 seconds. The Pioneer amp comes with the similar number of inputs and outputs, quite sufficient for the entry-level device. It misses only one coaxial, featuring spring-loaded terminals instead of the common for basic amps banana plugs, being prone to disturbance. The receiver comes with simple and intuitive remote, being simple and easy to set up, but its AM/FM antenna jacks are flimsy. The manual is not included and you are to use an online one. The same situation is with the Yamaha home theater manual that is easy to configure and operate. Its remote is clean and simple, performing most of the receiver control. Additionally, the amp’s display shows the features names that are plugged in at the moment, such as Xbox, Chromecast, Roku etc. When we compare Pioneer VSX-531 vs Yamaha RX-V383BL, we see that the Yamaha device is much more powerful, and, therefore, beneficially loud, suitable for larger dynamic sweep presentation. It produces natural, clear sound that is optimized, depending on the room. On the contrary, the Pioneer amp produces articulate, fast sound, but it’s still recommended for small and medium-size rooms, as it lacks some sonic solidity. Yamaha RX-V383BL versus its Pioneer counterpart is more powerful, smart and easy to operate. It produces clear, loud sound that is optimized depending on the room. On the other hand, Pioneer VSX-531 is simple, expressive and agile, producing articulate, fast, but still not solid enough sound. 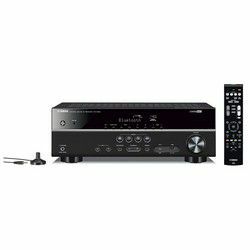 The A/V receiver is powerful, easy to operate due to 4 scene buttons. It produces clear, crisp sound that is adjustable thanks to the beneficial YPAO technology. It comes with the sufficient number of inputs, jacks and outputs, features Bluetooth connectivity, but the model is prone to overheating. 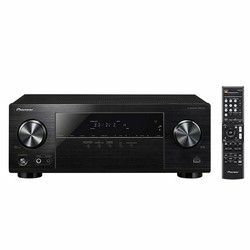 The home theater is simple, agile, coming with Bluetooth feature and a number of physical connections that are sufficient for a budget device. It produces fast and clear sound, that still lacks solidity. Additionally, it is equipped with spring-loaded terminals, having no networking features.